Visiting the dentist for the first time can be very intimidating for young children but we try to make each visit as fun and easy-going as possible to help ease their fears and make them enjoy coming back. The recommended age for a child’s first visit is before they even turn one, usually once they start growing teeth, but varies for each child. Your child’s pediatrician will often tell you when it’s time to visit the dentist for the first time but expect their first visit to be anywhere from one to three years old. 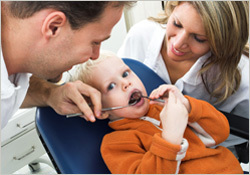 When your child comes to the dentist for the first time it’s usually for a quick exam or check-up. We try to make it as enjoyable as possible so they start to get more comfortable with the dentist. Dr. Harmon will come in and count their teeth and check to make sure they’re all growing in properly. He will show them a few of the dental tools such as his handy mirror, the squirt gun (water syringe) and the slurpy straw (suction tube). They may also get to enjoy a ride in the dental chair to experience how it goes up and down. After their visit they will be given the opportunity to choose a prize from the toy chest and will also get a gift bag with a new toothbrush and toothpaste. The more often your child visits the easier it will be. As your child gets a little older they will be scheduled for their first cleaning with the hygienist. For many children their first visit is also their first cleaning so they will also experience the chair ride and getting to know a few of the tools. The hygienists will give your child the choice of what flavor of cleaning paste and fluoride they would like and explains each process of the cleaning as she goes. Your child may also receive their first set of x-rays during this visit. If your child is cavity free they get to have their picture taken for our no cavity club! We strive to make each visit as fun and enjoyable as possible. Cleanings help clean areas of your child’s mouth that can be missed with brushing and flossing and helps fight decay so make sure you schedule an appointment every six months! Click here to schedule your child’s visit, children under three years old are always seen free of charge and we accept most insurances as well. Get your child on the right path for good oral hygiene early, they’ll be forever grateful!